KENOSHA, Wisc. 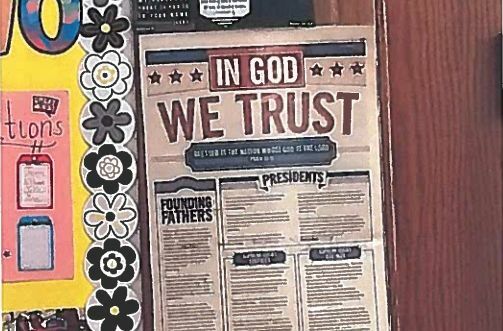 — A number of Christian displays have been removed from an elementary school classroom in Wisconsin after one of the nation’s most conspicuous atheist activist organizations sent a letter asserting that the posters and symbols were unconstitutional. Rob Moore, the local chapter president of the Freedom From Religion Foundation (FFRF), told WTMJ-TV that he had complained for months about the displays in his son’s fourth grade classroom at Pleasant Prairie Elementary School in Kenosha. Earlier this month, the organization’s headquarters sent a letter to the school district to request an investigation. “I don’t want someone’s personal myth-ark enforced in the classroom,” Moore, an atheist, told the outlet. The organization requested assurance that the displays would be removed from the classroom, in addition to a response to other concerns that include alleged field trips by some schools in the district to Timber-Lee Christian Center. According to Moore, the teacher has removed the posters and cross in light of FFRF’s letter. Read the letter in full here. The district has not commented on the matter except to state that it is under investigation. “The district is aware of the allegations and is working with our legal team to investigate the claims. No further details can be provided due to the pending investigation,” said Communications Director Tanya Ruder.